Chips? Chocky? A drink perhaps? Maybe a pair of havaianas? 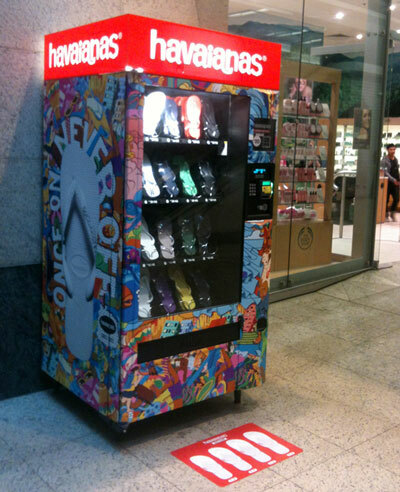 Look, you can buy your thongs from a machine! I saw this 'thong machine' in a Sydney Mall and later I saw a businessman, fully suited - with briefcase, take his shoe off and check his size. I don't know why I find this funny, but I do. I remember hearing about a craze in Japan where you could buy undies from a machine, used ones too. They'd pop out in a plastic bag. I wonder how much they cost and whose they were? Bizarre. Is there a whole bunch of people running around knickerless and wondering where their duds went? I guess with the weak economy, you've gotta make your dough where you can, so if you're strapped for cash just whip off those knickers and flog 'em in a machine. But don't wear a short skirt or you may get undesired attention.